The exhibition was held in the Rare Books Exhibition space, Sir Louis Matheson Library, Monash University from 30 July - 2 October 1998. 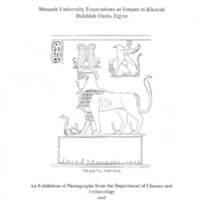 Photographs from Monash excavations at the site of Ismant el-Kharab, ancient Kellis, in Egypt's Dakhleh oasis are the basis of this exhibition. Items discovered on the site include almost perfectly preserved wooden books (codices), remnants of ancient texts written on papyrus and parchment, and fragments of pottery vessels, known as potsherds. Material from the Rare Books Collection supplements the photographs.